Pleasant St Alpine hotel. Veit is located in the picturesque village of Sexten (Sesto) in Alta Pusteria ski resort, about 700 meters from the center. Hotel has a long family tradition and belongs to a network of hotels "Vitalpina" whose philosophy is a combination of sport, physical activity, wellness and healthy local food. Alta Pusteria ski resort is located just near the Austrian border. Holiday Center Grand Hotel Centro Vacanze is located in the historic complex, which is located past the Grand Hotel Dobbiaco. The complex was built in the times of Austria-Hungary. Completely renovated, furnished in typical local style. Sonnenschein Residence consists of three different buildings - in the center of town Villabassa Dobbiaco (1154 m) and further in Colle di Casies, about 5km north of Monguelfo (ski area Plan de Corones). 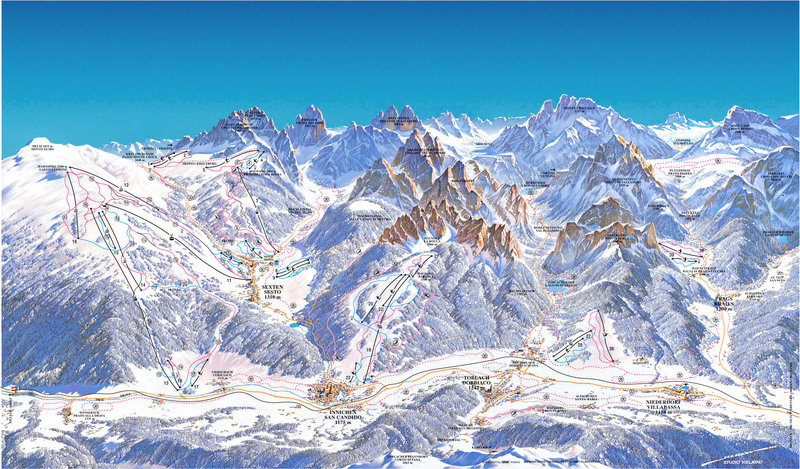 belonging to the group Dolomiti Superski, the marginal resort across a wide area, belongs to smaller, calmer.